I just noticed that I haven't posted in this blog for almost a month! I will tell you why--Christmas orders! Now that I'm almost done with my last order, I can start thinking about what my family and friends are going to receive! This is what I call (since this morning when I thought of it) "pro-hats-ination," mainly because I'm going to be knitting at least one hat a day until (and through) the 25th! Side note: it's kind of funny, knitting things semi-professionally, and a friend asks how you're doing. "Oh, just tying up loose ends...literally. That is what I'm doing. I'm taking loose ends and tying them up." 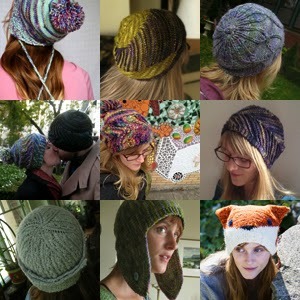 So speaking of loose ends, and family you would like to knit for, I'd like to announce my 40% off pro-hats-ination sale! If you enter the code "prohatsinate" when purchasing any of my hat patterns on Ravelry, you get 40% off, through Christmas day! Bon-Bonnet, Chopin Chapeau, Catalpa, Logan Boulevard, Wolcott, Paulina, and Foxversation Piece.